My big girl started 2nd grade this week and we moved into a new school. 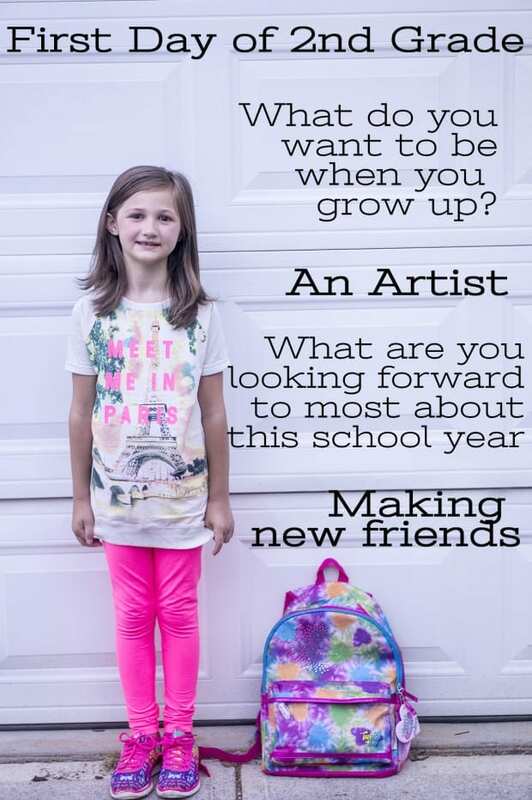 She was a little nervous about having to make new friends, but most of her classmates moved to the same school, it's just a matter of which class they are in. I'm sure she will love it, especially when she makes it to art class. I can't get over how big she is getting! The kid has the longest legs I've seen on a child, I think I need to get her into basketball. On to a new year, soon I'll be posting pictures on the little Peanut going off to Preschool. It's all going by too fast. Check out our other first days of school. I take a lot of pictures throughout the year. That's why I opted for the larger storage in my phone. I hate having unload my phone every couple of weeks. Best Buy has lots of great storage options if you are on the go taking pictures a lot. SanDisk makes a really cool external drive that you can connect to your iPhone or Android phone and it will pull the photos off of your phone and save them on the external hard drive so that you have more space on your phone. No more having to delete apps to make room. You can also get a microSD card to place into your phone to maximize the space on your phone. I use a SanDisk Extreme PLUS in my camera because I film videos in 4K and 1080HD. It can write to files faster than other memory disks. I like faster. It makes my life much easier.